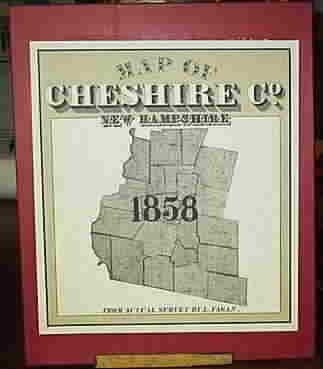 An attractively boxed portfolio of maps, charts and engravings, completely reproducing the original 1858 "Map of Cheshire County, NH". There are 18 full-scale town maps and 25 village map details. Shows 1000s of homeowner names and their house locations. A great resource for genealogy. Fine quality acid-free paper. boxed set, 36 sheets, 14" x 17"